The AAPK #74 pictured here is a factory second with no blemishes that I could find which was purchased specifically for EDC duty. I love carrying this knife. Thats a nice rotation Tony... ..and for its size the 74 is hard to beat. WelderBob wrote: Thats a nice rotation Tony... ..and for its size the 74 is hard to beat. 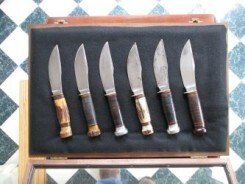 Man some gorgeous knives being displayed above, makes me want them all. I'm leaving the house in a few and gonna make it a GEC day. Couldn't decide on a drop point or clip blade, good thing pants come with multiple pockets. Would love to strap the hatchet to my belt as well but may not be looked upon favorably by others in town. Sweet bones on the Drop P 74. A shot of my most carried and used EDC this week. I've used this one off and on for a couple of years. Good looking bone color, nice bolster flutes too, that's pretty. This is rotated in and out regularly lately. You'll never regret having that Viper around. Niiiiiiiiice.